I know that I was all about carbs and comfort food in my previous post. But, just because the fall winds are howling and the temperatures are slowly dropping, doesn't mean we have to stop enjoying fresh vegetables and fruits! I try to enjoy salads all year long. Although, I will admit, I am more drawn to salads in the warmer months. It just has to be the "right" salad to convince me to make it when it's cold out. This definitely fits the ticket for the "right" salad. I still have a handful of apples left from our picking adventure this fall. They were just asking to be used for this salad. 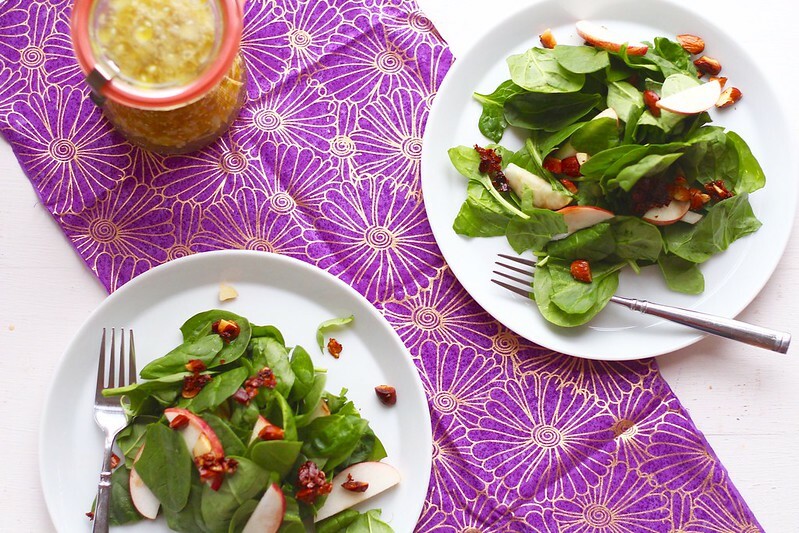 This salad is incredibly simple, yet incredibly delicious. 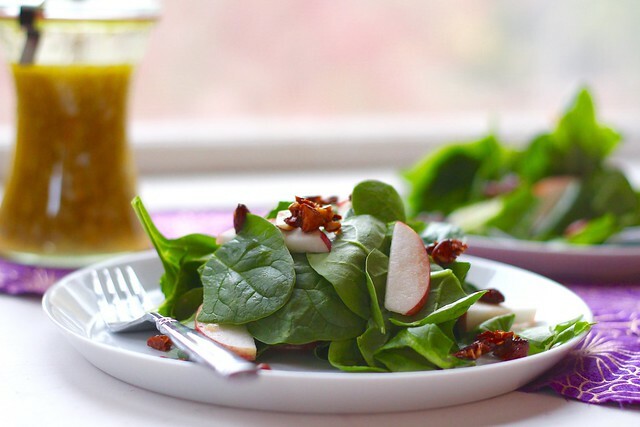 A handful of spinach is topped with delicious, buttered almonds, fresh apple slices, and a slightly sweet, homemade dressing. If my family was into feta or goat cheese, I would crumble the heck out of it over the top. This salad would also be great with the addition of grilled chicken, or perhaps salmon. A great light lunch, or a starter salad for dinner. To make the dressing, combine the onion, apple cider vinegar, white wine vinegar, sesame seeds, paprika, sugar, and olive oil in a small bowl or jar. Whisk or shake well to combine. Refrigerate until ready to use. Shake or whisk again before using. To make the buttered almonds, melt the butter in a medium skillet over medium-high heat. Add the almonds and cook, stirring occasionally until toasted and lightly browned. Stir in the sugar and cook just until melted and well incorporated. Set aside to cool. 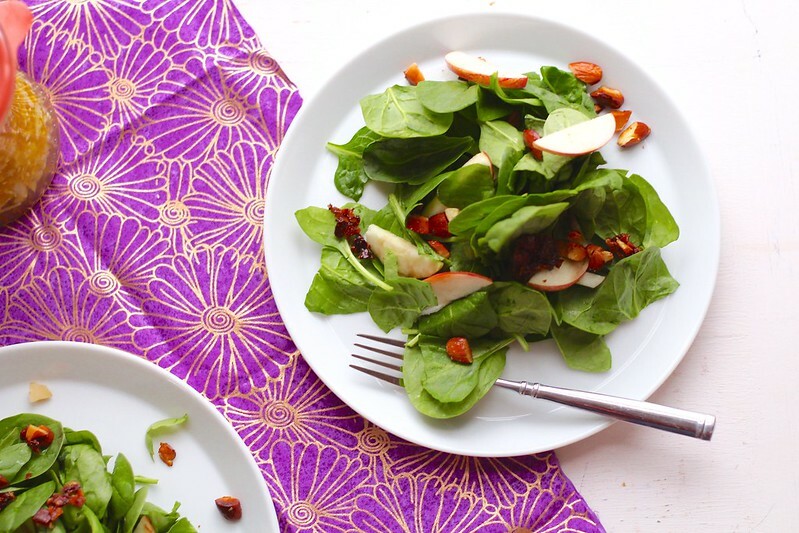 Divide the spinach between plates or bowls. Top with apple slices and the buttered almonds. Drizzle with the dressing and serve.